Spoilers officially begin today for Shadows over Innistrad, but before spoilers begin, let's take a look at Innistrad's past and the theories surrounding the future. Let's jump right in with Innistrad, the first set of the original Innistrad block. On Innistrad, the primary creature types on this semi-tribal world are Spirits, Zombies, Vampires, Werewolves, Humans, Angels, and Demons. There are also several other various creatures that inhabit Innistrad such as Devils, Dragons, and Insects and a variety of other "horror" associated creatures. Among the primary creature types, we find Spirits in White/Blue, Zobmies in Blue/Black (the blue ones being created by scientists like Frankenstein's Monster and the black ones being raised from the dead), Vampires fit withing Black/Red, Werewolves being Red/Green, and then Green/White basically being where normal humans would fall. Angels fit within white and Demons within black. Devils, the only close contender for an additional primary tribal type fits in red. In the story of the block, Liliana had cursed Garruk with the Chain Veil and he was pursuing her for revenge. Liliana has a particular purpose being on Innistrad as she is trying to hunt down one of the demons who owns a piece of her soul, Griselbrand. In Innistrad, we had three basic keywords: Flashback, Transform, and Morbid. Transform's example can be seen with Garruk Relentless, although it also fits with the variety of werewolf creatures. Nightfall predator also shows a... somewhat mechanic fight. Basically two creatures each deal damage to the other. If it exists on a single card in a set, I don't see it as a "real" mechanic. Moving on to... Flashback! Flashback is basically just a way to cast spells a second time. In a sense, if you have four copies in your deck, you can cast them each an additional time allowing you to utilize the effect eight times in all. Morbid is just an ability that triggers if a creature has died prior each spell resolving and each creature entering the battlefield. The story continues with more creatures among the various tribes, but the transform cards change more and more. Some creatures transform into enchantments and some artifacts turn into creatures. Sorin is the only planeswalker from the set and Sorin is here because Innistrad is Sorin's home. He created the now missing Avacyn and has come back to find her. The keywords from Innistrad returned for another run in Dark Ascension but we also got Fateful Hour and Undying. Fateful Hour exists to provide a benefit for when you have less than five life. Undying is a pretty cool mechanic as you get your creature back once it dies and it comes back even better! There were some exploits used to remove the +1/+1 counter in order to continue bringing the creature back when it was Innistrad Block and Return to Ravnica block in Standard and it was cool, and I certainly hope we see this mechanic again. I hated playing against it, I loved playing with these creatures, and looking back, those were some great games. Moving on! There is less tribal in the third set. The Werewolves are gone and transformed into the Wolfir, which may not be a creature type, but it's similar to the Naga and Ainok or Khans of Tarkir. 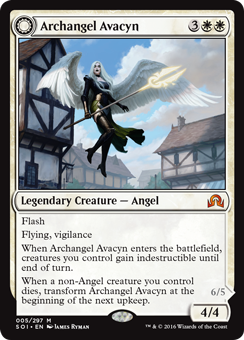 This time, there is a lot more involving Angels vs. Demons, and the two missing being that our planeswalkers have been looking for are here again now that they Helvault has been destroyed. Enter two new planeswalkers: Tamiyo and Tibalt. Tamiyo is from Kamigawa and is here investigating the strange properties of the moon (enter Shadows over Innistrad) and Tibalt is a human/devil who enjoys inflicting pain. Basically a sadist. He comes from Innistrad and had a fight (non-canonical?) with Sorin in the Sorin vs. Tibalt Duel Deck. Undying returned from Dark Ascension, but we got two pretty cool mechanics in Miracle and Soulbond. Miracle was pretty sweet and there's even a Legacy deck utilizing Miracles. Basically any time this is the first card you draw during a turn, you can cast it for a cheaper cost that it originally has. Basically, sorceries become instants only if you cast it when you draw it and not later in the turn. Either way, these spells were pretty sweet. I loved these creatures. Basically by "pairing" two creatures together, they both got an ability until one of them dies, or gets flickered or anything similar. Deadeye Navigator caused shenanigans with Zealous Conscripts for some infinite mana with M13's Gilded Lotus and man it was annoying, especially during Two-Headed Giant where one guy ran interference for his partner who held counterspells and then cast Past in Flames for its flashback cost. It sucked, but it was good Magic. 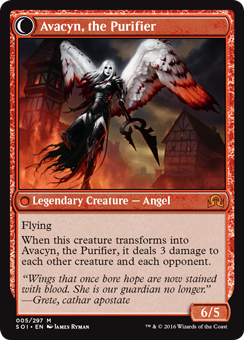 Avacyn is back and is killing humans now and we'll find out why soon enough. We have spirits, humans, zombies, vampires, and werewolves back and Transform is the only mechanic returning from the original block. So far it's shaping up to be an incredible horror/mystery block and I can't wait. We have Jace as the face of the set and we know of a new planeswalker Arlinn Kord who is a werewolf, and then we have mentions of Nahiri and Tamiyo as well as the knowledge of Liliana being the face of Eldritch Moon. Since Sorin is from Innistrad, it stands to reason that we'll see him here, so as far as planeswalker cards go, out of this block we can assume three: Jace, Liliana, and Arlinn Korn solely because of Arlinn's Planeswalker profile and how a planeswalker featured on the promotional and box art of a set typically has a card, so Jace will be in Shadows over Innistrad and Liliana will be in Eldritch Moon (for whatever reason she returns to Innistrad, we do not know). Basically, the story is ramping up to be incredible and we're already seeing some pretty great cards. Stay tuned and we'll provide updates in the next couple weeks on how the world is shaping up.